*excludes coriander garnish, rice and naan bread 5-A-DAY PORTIONS One serving counts as 2 of your 5-A-DAY target of fruit and vegetable portions. 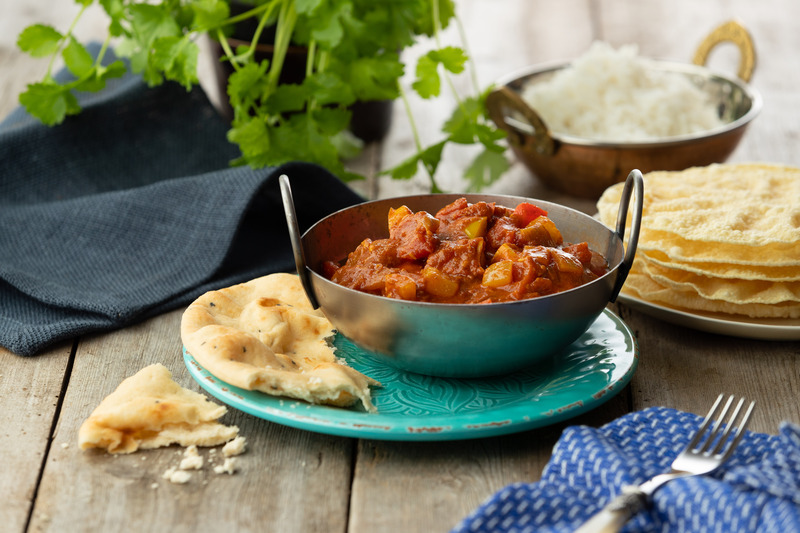 Just in time for National Curry Week (22nd – 28th October 2018), here is the next recipe in our ‘Family Fakeaway’ series – a sensational chicken jalfrezi! Filled with canned ingredients, this tasty jalfrezi will be sure to keep those takeaway cravings at bay. In a large pan, fry the onions, garlic and peppers in the ghee until softened. Add the jalfrezi paste and continue cooking for 1 - 2 minutes. Add the chicken, canned tomatoes and 200ml of water. Simmer for 8 - 10 minutes until everything has heated through and the sauce thickens. Serve with a handful of fresh coriander, rice and naan.